The model motion, accessible from the latest news page of that website, says “We urge unions involved in industrial action to consider May 1st as an appropriate date for such action.” One such union involved in a dispute is the National Union of Teachers (NUT); if it called another strike on that day, that would be particularly effective at building a big demonstration, since many parents and school students could join it as well as striking teachers. 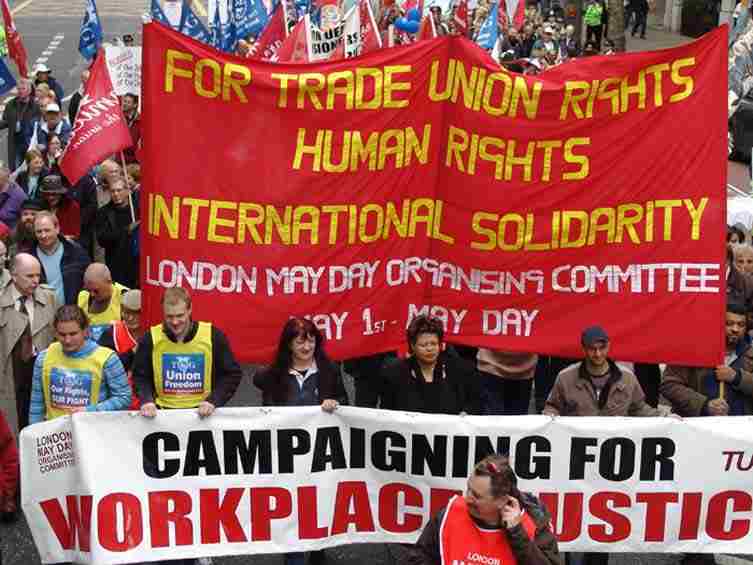 There will be many other demonstrations across the world on May Day and I am publicising these on an International call to Reoccupy the Streets Facebook event. For some of my personal views about the economic problems that are used as the justification for austerity (for which I think a very democratic socialist solution is required rather than tinkering around the edges with gradual reforms to capitalism that are wholly inadequate in this period of global capitalist crisis), browse some of my articles in the Economy category on this blog. For those who think that the power of the state (including revelations about the National Security Agency in the USA and its PRISM project, with similar surveillance in the UK from GCHQ, and infiltration from Special Branch within the police force or MI5) are too strong for an effective fightback, go to my blog entry #Budget2014: Alan Turing Institute for big data & algorithm research, towards fascism forever (Turing stopped in WW2) – and read the comments after my post for my interactions with a representative of a socialist conspiratorial organisation (and judge for yourself whether he and that organisation are genuine)! This entry was posted in Benefits, Democracy, Economy, European Union, Internationalism, Music, Poverty, Racism/Fascism, Strikes and tagged 1%, 99%, austerity, big business, BNP, bourgeoisie, British National Party, Capitalism, credit crunch, cuts, general strike, Greater Manchester, international solidarity, International Workers' Day, London, London May Day Organising Committee, Manchester, mass strikes, May Day, MayDay, Occupy, People's Assembly, proletariat, ruling class, Salford, Socialism, trade unions, Trades Union Congress, TUC, UKIP, United Kingdom Independence Party, working class. Bookmark the permalink.